The last color dragon to be given the shade treatment, though not the last article in this series. Shades of black really turned into shades of dark gray, but hopefully you’ll find these reptilian horrors useful. ARSENIC DRAGON: The arsenic dragon is small and serpentine, with small, clawed legs that allow it to scamper and climb. Frills run along its sides that allow it to glide at a speed of 18 for a distance equal to 3 x the height at which is begins its flight. Arsenic dragons can always speak, and are quite talkative. They never cast spells because they are immune to magic. They dwell in small places, being able to curl up into a surprising small ball (3-ft in diameter) and stash their treasure all over their territory in tiny parcels usually wrapped in animal skins. 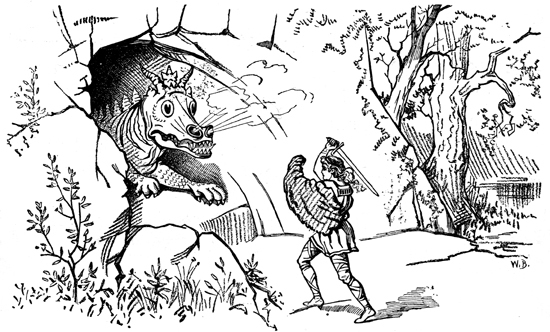 An arsenic dragon’s bite is poisonous, forcing folk to pass a save or suffer one of the following effects: Fail by 1 to 3 points – fall asleep for 1d3 turns; fail by 4-6 points – paralyzed for 1d3 rounds; fail by 7+ points – suffer damage equal to normal breath weapon damage. BISTRE DRAGON: These large dragons dwell in large rivers and occupy a niche similar to whales. They are quite graceful when swimming, but become lumbering brutes on land. One often finds them floating on their backs in the midst of a river, seemingly immune to the current and snoozing or daydreaming. Bistre dragons are sagacious and have acerbic personalities – they are not as thoroughly evil as black dragons, but have a general disdain for others only overcome by their need to dominate them intellectually. Bistre dragons have a 90% chance to speak, and those who can speak have a 25% chance to cast 1d4 first level magic-user spells and 1d3 second level magic-user spells. A bistre dragon’s acidic spit does not affect flesh, but corrodes, tarnishes and rusts all forms of metal as the touch of a rust monster destroys iron. Creatures that are spat at must pass a saving throw or lose one random piece of metal equipment. TAUPE DRAGON: Taupe dragons are small, quick and persistent dragons. They ooze acid from their teeth, claws and scales and are thus a blight on any landscape. Taupe dragons are territorial, marking their territory by rubbing their acidic bodies against trees and eating away the bark. Pools they visit frequently are often mildly acidic. Taupe dragons are more obsessed with treasure than most black dragons, using the precious metals as bedding, for precious metals are immune to their acidic bodies. Victims of the dragon’s claw and bite attacks may make a saving throw to avoid the extra acid damage. Touching a taupe dragon’s body causes 1d4 points of acid damage, and normal weapons used against a taupe dragon might be eaten away. Each time a hit is scored on a taupe dragon, a saving throw must be made. If failed, the weapon’s damage dice is reduced by one dice size (i.e. 1d6 to 1d4 or 1d4 to 1d3). A weapon reduced to 0 damage is useless. Weapons can be repaired, but will only regain one dice size at a maximum. Magical weapons need not make this saving throw. Each time a victim suffers acid damage from a taupe dragon, their armor’s armor bonus is reduced by one (no save). Again, magical armor is unaffected. Taupe dragons have a 25% chance of speech and the normal chance for black dragons for casting spells. ONYX DRAGON: Onyx dragons have glistening black scales, short, thick necks, faces reminiscent of pit bulls with a double pair of horns, one curving upward, the other downward. They are stocky, with long, powerful tails that they make use of in combat to knock their opponents off balance. Each round in melee combat, those who fail to hit the dragon must pass a saving throw or be knocked off balance, suffering a 1d4 point penalty to AC for that round. Onyx dragons are lazy, physically and mentally, but no less arrogant for it. They consider themselves the most intelligent of creatures, when in fact their ignorance is monumental. When forced into discourse, they prattle on about this and that, vomiting streams of jargon and referencing obscure texts but never really proving anything. The acidic breath of an onyx dragon seeps into one’s bloodstream and affects the mind. Those hit by the breath must pass a saving throw or suffer one of the following hallucinogenic effects: Fail save by 1-3 = confusion for 1d6 turns; fail save by 4-6 = waking nightmare (per the spell); fail save by 7-9 = phantasmal killer effect (as the spell). Onyx dragons have a 65% chance of speaking, and those with speech can use telepathy out to 120 feet. They have a 15% chance of using 1d6 first level magic-user spells as psychic powers (i.e. they need not speak or move to engage them). ← Hell Preview 4 – Iron, Salt and Fire! The Liver Dragon ability is really cool.